Mexican Pizzas start with seasoned ground beef, beans, cheese and enchilada sauce stuffed between two golden flour tortillas. 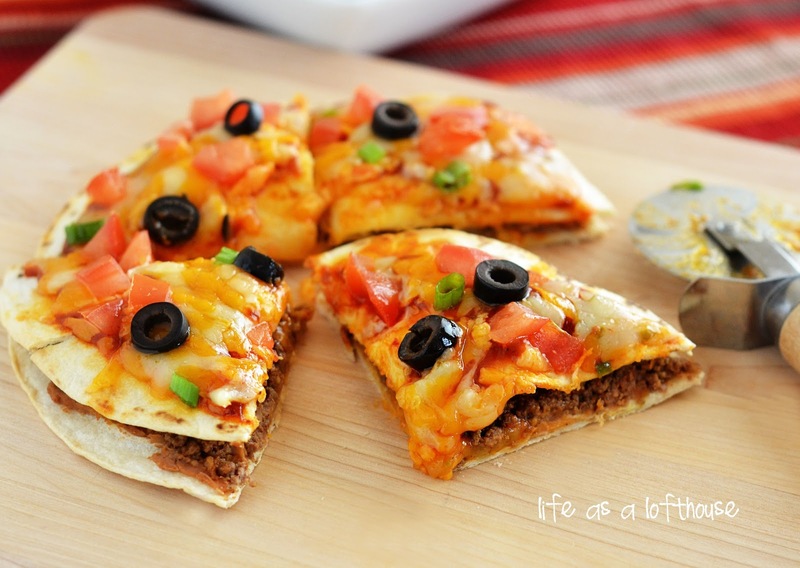 They are a delicious twist on traditional pizza! The first time I ate a Mexican Pizza was at Taco Bell. I thought it was the yummiest thing in the world! They start with seasoned ground beef, cheese, enchilada sauce all packed between two flour tortillas. They taste so good and are a fun twist on traditional pizza! Seasoned ground beef, enchilada sauce and cheese stuffed between two golden flour tortillas. These will be a hit with the whole family! In a microwave-safe bowl, heat the refried beans until warmed through. Spread a thin layer of beans on one tortilla. Top with ⅓ of the meat mixture. Place another tortilla on top of the meat. Spread 3 Tablespoons of enchilada sauce on top of the top tortilla. Sprinkle with some cheddar cheese and pepper-jack cheese. Add a few dices of tomato, green onion and olives. Oh how I love your blog…. And Taco Bell Mexican pizzas!! 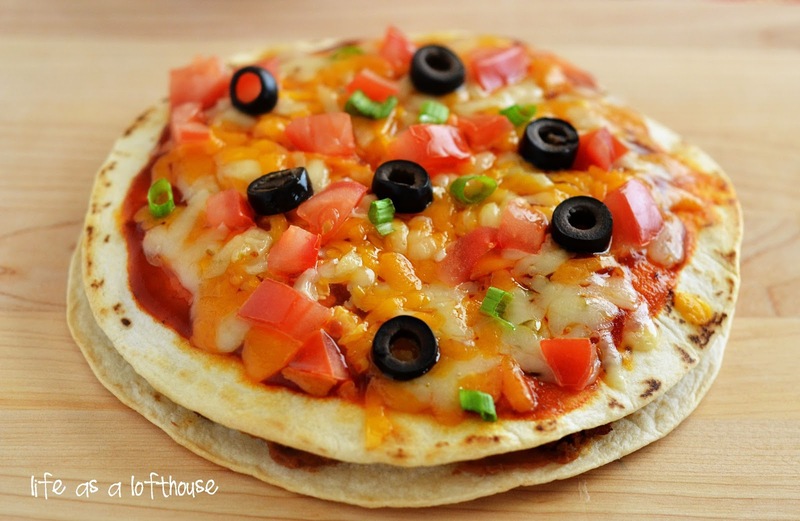 I am making your pizza-dillas to tonight… And these definitely next week! Look delicious, I love good food… This is part of my life. I love me a good Taco Bell burrito! 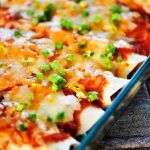 I don’t think I’ve ever had a Mexican pizza there, but now that I’ve seen your recipe, I probably never will! This looks so tasty and way healthier than Taco Bell! I’m pinning to try soon! Love this! I used to love Taco Bell! I am making this tonight, can’t wait to see how it turns out! Oh my gosh! These are great…with a few modifications we will make them crispier with the taco salad bowl type tortillas. 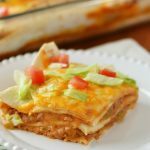 These were absolutely fantastic for a weeknight meal! The Mexican Pizza’s are always what I got too, when we went to Taco Bell. Wish I could eat them for lunch nearly everyday!! I think these will be so much better, since the last time I went to Taco Bell, they were putting less and less stuff in their pizza’s. YES, LESS STUFF AND MORE MONEY, THAT IS WHAT YOU CALL SLAUGHTERING THE PUBLIC!! Made these tonight and they were a hit! I love that nearly everything was already in the pantry and I could just keep the recipe in my back pocket. I made these for dinner tonight! AWESOME!!!! My hubby loved it and he does not eat Taco Bell. My mouth is watering!! haha You’re cooked meals look so good! Just made these for dinner. Ten minutes for the wraps burned them to a crisp…so I redid the wraps three minutes on each side. Perfect and the family is already begging for me to make them again. Thanks for the great recipe! The Mexican pizza is delicious! My husband and I were going to a local Mexican restaurant when I found this recipe. I had everything but the taco seasoning, so I researched that online and used the recipe I found. Also, my flour tortillas were the 6in size and I was afraid I would not have enough. One pizza /person was too much! I offered sour cream on the side, and this was a big hit.Great recipe. We made these a while back and they were awesome! The only problem I ran into was the tortillas bubbling up too much. I wonder if poking holes in the tortillas with a fork beforehand would solve this problem? Yes this does solve the problem, beautifully. Made these last night. Awesome! Holly, I have a question. It says it serves 4 but it only makes 3 pizzas….two people only get half a pizza? LOL Also, I took the comments to heart and only did my tortillas for 3 minutes on each side and it was just right. Change for the recipe?? GREAT recipe though! Thank you. If you cut each pizza into quarters and serve it to 4 each serving is 3 pieces. Kinda complicated lol. I should just change it to 3 servings 🙂 Glad you liked it! Thank you for this recipe! I am gluten free and I miss so many things from Taco Bell. I wouldn’t get the pizzas very often, but when you can’t have them, you want them more. 🙂 I used Udi’s GF tortillas and they worked perfectly. It was so great to be able to have them again. Wonder instead of beef could you use chicken? Definitely, Barbara! I think some cooked shredded chicken tossed with some taco seasoning would be really great on these! I just made these tonight and they were BETTER than Taco Bell for sure! I made a vegetarian version using refried beans seasoned with taco seasoning. I was looking for something easy because I had no husband or kids to cook for tonight, and this was perfect! (Really quick without having to cook the meat- and I only heated what I needed). With the leftover ingredients, I can whip one up so fast while I am eating solo for a couple days. So much better than the cold turkey sandwich I would usually opt for. Thank you so much for all of your great recipes and ideas! On the very rare occasion (its been years) that I go to Taco Bell, this is what I always order. Why have I never thought to make it at home?? This is SO happening! Can you substitute corn tortillas? I have celiacs and cannot have flour, but I wouldn’t know the cooking time differences, if any. I REALLY want to make these! YES… I made a batch of the filling.. and ran out of Flour Tortillas, but had some Corn ones…. Just make sure you bake them on a baking sheet…. it kinda softens the corn tortillas up while they bake,, after they’ve been browned/fried… Turned out AWESOME !!!!! New follower! Love your recipes and all the pictures to go with them! Made these pizzas tonight and they were a 10 out of 10!! Big hit with the whole family! Thanks!! mdeerose@wowway.com. I just came across your recipe this morning. I’m so excited to make them. Saved your recipe till I pick up all the ingredients. Thank you for sharing this recipe. Has anyone tried making these ahead and freezing them? Do you think they’d do ok in the freezer? I’m thinking just the tortillas, beans, sauce, and meat. Add other toppings when ready to cook. Thoughts? THANK YOU! My hubby asked for Taco Pizza like taco bell. I have never had one, and had no clue where to start. Thank goodness I found your recipe. He said “This is exactly like I remember!” He was so excited about the refried beans in it (he doesn’t normally eat them). And kept gushing about the awesomeness of it. Our kids even raved about! Made this tonight. Better than Taco Bell. Used a packet of Taco Bell mild seasoning. Used La Preferida refried beans. These are the absolute best for recipes that call for a very smooth spreadable type. Don’t even need to heat. . I did the 10 minute total in oven for crisping with homemade tortillas and that worked perfect for me. The only thing I did different was I didn’t cut the finished pizzas. We ate them whole in our greedy hands. They didn’t fall apart. Were delectable. Thanks! just made this it was delicious my son’s loved it and it was very filling and easy to make!!!!! I made this tonight. I used left over rotisserie chicken mixed with a little enchilada sauce, and mixed a little taco seasoning with the beans. I also put Veges on after it came out of the oven. It turned out supper yummie!